Donating your time or books will make a world of difference to a child and his/her family. Here you’ll find a list of organizations that dedicate themselves to literacy and getting books to readers in need. If we’re missing your literacy nonprofit, send us an email [thereadingtub [at] gmail.com] and we’ll add it to our directory. These are the sites on our Short List! Jen Robinson’s Book Page – scroll down to “Programs that Focus on Giving Books to Kids” on the right side. ProLiteracy — This is an international literacy organization, offering services for adults and children throughout the world. Visit the ProLiteracy website, enter your zipcode and find organizations in your area. Ronald McDonald House Charities (North America) RMHC works with families at the hospital and in the homes they sponsor. They are frequently in need of books for families to share. You can volunteer to work in a Ronald McDonald House. There are Ronald McDonald Houses throughout North America. 1-800-Volunteer.org is a national (US) registry. Nonprofits list their volunteer opportunities and projects. Search by topic and/or zip code to find an organization near you. Adopt a Library Literacy Program (Canada) The Royal Canadian Mounted Police (RCMP) has created this program where police organizations partner with public and school libraries to promote literacy, crime prevention, and open lines of communication within the community. Children’s Book Bank (Canada) “The Children’s Book Bank is a charitable organization designed to support children’s literacy by providing free books and literacy support to children in lower income neighbourhoods.” The organization serves the Toronto community in Ontario, Canada. Children’s Book Project (USA-California) This is a literacy nonprofit that provides free, new and gently used books to at-risk kids in the San Francisco Bay (California) area. The website offers instructions on how to organize a book drive. Children’s Literacy Foundation (CLiF) (USA-Vermont/ New Hampshire) CLiF works to nurture a love of reading and writing among rural and at-risk children in Vermont and New Hampshire. Through 16 literacy programs, CLiF serves 15,000 children each year. CLiF provides brand-new books to kids, gives inspiring storytelling presentations, sends authors into schools, donates books to rural public libraries, sets up children’s book libraries at sites such as low-income housing developments and prison family visiting rooms, and much more. The nonprofit is based out of Waterbury Center, VT. Cops ‘N Kids (USA-Wisconsin) Founded by a Wisconsin police officer, Cops ‘N Kids strives to get books into disadvantaged children’s hands. They have a reading center in Racine that “provides children with an opportunity to receive one-on-one tutoring, group reading sessions, and individualized curriculum plans that are necessary to develop reading skills” and they are working on expansion of the program. First Book is a national (US) literacy advocacy/outreach organization. First Book gives new books to low-income families with young children throughout the United States and Canada. The organization has a number of entities in place to offer free and low-cost books for the children they serve. There are also volunteer opportunities, with more than 270 Advisory Boards (volunteer groups) throughout the country. National Institute for Literacy (USA) – On this website you’ll find information for literacy for all ages, from childhood to adult. It is built to be a “national resource on current, comprehensive literacy research, practice, and policy.” Within the site you will find America’s Literacy Diretory, which lists community-level groups, organized by the audience served. Reach out and Read is a national (US) nonprofit that supports early literacy. Volunteers work in ROR program offices (e.g. pediatricians) reading books with children and modeling book-sharing techniques for parents. ReadAloud.org (US-Michigan) – Founded in 2008, ReadAloud.org is a 501 (c) (3) non-profit organization that works to ignite a passion for reading aloud in families nationwide. Read Indeed (USA-national) Nine-year-old Maria Keller started this nonprofit in 2007, hoping to get one million books into the hands of children by her eighteenth birthday (2018). So far she’s got just over ten thousand, passing them on to various charitable organizations. You can donate or suggest an organization by emailing her at readindeedforkids@yahoo.com. Reading Connection (USA-Virginia) This is an Arlington-based nonprofit. The RC provides literacy program for young children in 13 homeless shelters in the Washington, DC metro area andNorthern Virginia. Mentors work directly with children. The organization also accepts donations for books, and maintains a wishlist of titles for books and categories of books (e.g., easy readers) that it needs for its Read Aloud program. Reading is Fundamental (USA-National) Reading Is Fundamental, Inc. prepares and motivates children to read by delivering free books and literacy resources to those children and families who need them most. Founded in 1966, RIF is the oldest and largest children’s and family nonprofit literacy organization in the United States. See especially the Family of Readers program. Ready at Five (USA-Maryland) Ready at Five’s mission supports the idea that all children in Maryland should have the opportunity to develop all of the skills to be ready to start kindergarten and be able to succeed in school. Their resources are meaningful to and practical for parents, teachers and caregivers of young children. The information is age appropriate for early childhood and is accessible for time-crunched parents and caregivers. The resources are not wordy and are not too academic; the information is straightforward. SOHO Center (USA-New York, Virginia) The Soho Center actively promotes children’s literacy. One of the ways we do this to give away collections of quality children’s books to programs and organizations which serve low-income children. Success Won’t Wait (USA-Delaware) Success Won’t Wait, Inc. is a not for profit literacy program based in Wilmington, Delaware. The organization’s mission is to encourage reading, particularly by children, and services Delaware and the surrounding states. State Literacy Organizations Nearly every state in the US has a state-sponsored umbrella organization. 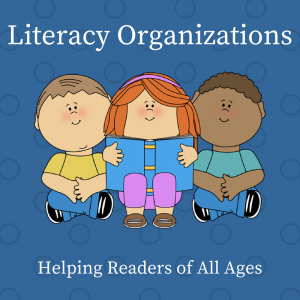 To find these organizations, type in your state name followed by at least one of these phrases (use a hyphen for best results): literacy association, literacy coalition, literacy organization. Jen Robinson’s Book Page has an extensive list of state-level groups in her blogroll.